First things first – if you’re looking for an authentic Bolognese ragù recipe – this isn’t it (go here if you want the recipe for the traditional authentic dish from the Emilia-Romagna region, which is made from a mix of pork and beef and contains milk). However, if you’re a fan of spaghetti Bolognese, which is probably one of the most well-known household dishes in Europe (also known simply as spag bol in the UK), read on. While this isn’t a true Italian dish, it has been integral in making Italian cuisine one of the most beloved around the world. The simple combination of beef mince, tomato sauce, Parmesan cheese and basil might be nowhere to be seen in Italy (apart from the odd tourist trap), but it has been adopted by British and Americans and now forms an important part of most weekly dinner plans in both countries. What makes it distinctly un-Italian? 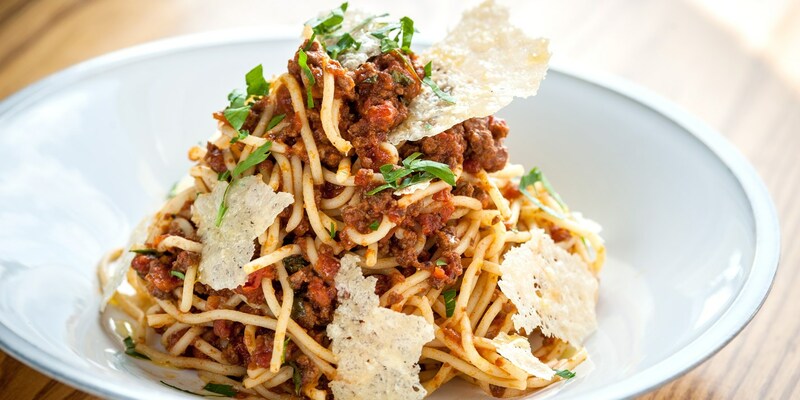 For starters, the pasta (spaghetti) and the sauce (Bolognese ragù) are from completely different parts of the country. Spaghetti is a southern Italian speciality, while the ragù comes from Bologna in the northern region of Emilia-Romagna. Southern Italians don’t tend to eat dishes that are so rich in meat and cheese, while northern Italians would favour their own tagliatelle over spaghetti any day of the week. Whether you care about authenticity or not, it’s clear that spaghetti Bolognese is popular for a reason – it tastes delicious and is easy to prepare. Below is the classic way to prepare it at home, but if you're after a more authentic taste of Italian pasta, take a look at our list of the most famous traditional pasta dishes of Italy. You can add other vegetables to spaghetti Bolognese to bulk it out and help little ones towards their five a day. Try adding diced carrots, mushrooms and courgettes and serving with a green salad.